Drowning is the leading cause of death among children aged one to four. Therefore, California government passed a law stating that labels depicting a baby falling into a bucket must be placed on opposite sides of any four to six gallon open head pails and containers. 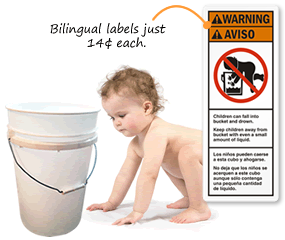 We offer the lowest prices on these Baby in the Bucket Labels! Warn parents and guardians and prevent any negligent behavior towards kids. • Prevent tragic accidents by clearly marking the drowning hazards present. • Make sure that all of your liquid-holding containers are marked as needed with these labels. • Label meets the California alternate label design as well as ASTM (American Society for Testing and Materials ) Standard ES 26-93. As Low As 24¢ per Label!